William Henry Purnell Blandy (June 28, 1890 – January 12, 1954), known to friends as "Spike", was an admiral in the United States Navy during World War II. Born in New York City 28 June 1890, Blandy graduated first in his class from the United States Naval Academy in 1913. He participated in the occupation of Veracruz, Mexico in 1914 and served on board the battleship Florida (BB-30) with the British Grand Fleet during World War I. During World War II he was Chief of the Bureau of Ordnance from 1941 to 1943. Here he had a controversial role in the infamous torpedo scandal  involving the initially practically useless Mark 14 torpedo, and the long delays incurred on the work testing and launching the electric Mark 18 torpedo. In December 1943 he became Commander, Group 1, Amphibious Force, Pacific Fleet, and commanded the pre-invasion bombardment group during the campaign for Iwo Jima. The U.S.S. Estes was positioned about two miles off-shore during the bombardment, and Admiral Blandy, being the old Gunnery type, kept ordering the captain to come in a little closer so he could "..see the whites of their eyes..". About the time we would be within a little less than a mile from the beaches, a battery of shore guns up on the side of Mount Surabachi would start taking pot-shots at us. Geysers of water would erupt on either side of the ship, and the voice of Vice Admiral Turner in overall charge of the campaign on the U.S.S. Mount McKinley — a sister ship to the USS Estes, — would come in over the "TBS" ship to ship radio ordering Blandy to "..get your [censored] out of there before you get it blown off!". We would then back off to a safe distance, only to have the same thing happen a few hours later. After the war he commanded Joint Task Force 1 during the atomic bomb tests at Bikini Atoll. Vice Admiral Blandy and his wife cut the cake celebrating Operation Crossroads as Rear Admiral Frank J. Lowry looks on. 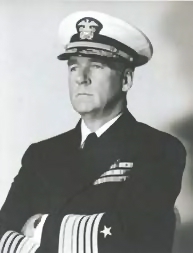 In mid to late 1945, Rear Admiral Blandy served as Commander, Destroyers, Pacific Fleet (ComDesPac). 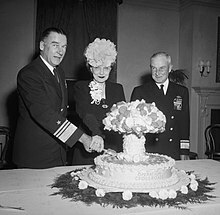 In late 1946, a minor controversy erupted over a published photo (shown at left) of Vice Admiral Blandy and his wife cutting an "atomic cake" in an event celebrating the disbandment of the team behind Operation Crossroads. He commanded the 2nd Task Fleet and later served as Commander-in-Chief, Atlantic Fleet from 1947 to 1950. Admiral Blandy retired in 1950. He died on 12 January 1954 at the U.S. Navy Hospital in St. Albans, New York, and was buried in Arlington National Cemetery. In 1956, the destroyer USS Blandy (DD-943) was named in his honor. ^ Blair, p.403 et al..
^ September 7, 2010. The Atomic Cake Controversy of 1946, Blog site: Conelrad Adjacent. Wikimedia Commons has media related to William H. P. Blandy. "William H. P. Blandy". Find a Grave. Retrieved 29 January 2008. This page was last edited on 9 January 2019, at 15:32 (UTC).